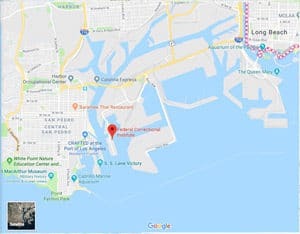 Location: FCI Terminal Island is located in Los Angeles Harbor, between San Pedro and Long Beach; off Harbor Freeway (110 South) at the Terminal Island exit. Background: FCI Terminal Island was opened in 1938 and served as the Naval Disciplinary Barracks from 1942 to 1950. For a period it also was a medical facility for the California Department of Corrections. In 1995 it was converted into the Low Security Federal Prison it is today. FCI Terminal Island serves as a medical facility for the Federal Bureau of Prisons. Notable inmates include internet music entrepreneur Mouli Cohen (serving a 22-year sentence for wire fraud, money laundering, and tax evasion), Earth Liberation Front member Eric McDavid (released in 2015 after serving 10 years for conspiring to destroy a dam, a lab, and other targets), former stockbroker Anthony Elgindy (released in 2013 after serving 8 years for racketeering conspiracy, wire fraud, securities fraud, and extortion), and Admiral Robert Gilbeau (serving an 18-month sentence for lying to investigators). Housing: Inmates are housed in various housing structures ranging from dormitories to one and two-person cells. Health Services: On-site emergency medical care, sick call, dental call, and medication are all provided at FCI Terminal Island. Emergency care is available 24 hours a day. Psychology Services: FCI Terminal Island offers screening, assessment, and treatment of mental health and drug abuse problems, individual and group counseling, psycho-educational classes, self-help and supportive services, and referral to Health Services for medical treatment of a mental illness. Notices of upcoming treatment programs are posted in inmate housing units. Inmates must submit a cop-out requesting program placement. Residential Drug Abuse Program (RDAP): FCI Terminal Island houses a Residential Drug Abuse Program (RDAP). The facility also provides drug education classes and a Non-Residential Drug Abuse Program (NR-DAP). Education Services: FCI Terminal Island offers literacy, GED, and English-as-a-Second Language (ESL) programs to inmates. Incentive awards are provided to recognize inmates making satisfactory progress and successfully completing the literacy (i.e., GED and ESL) program. Inmates may also receive incentives for progressing to various levels in the GED or ESL programs. Graduation ceremonies recognize GED, ESL, and Occupational Education completions. A parenting program and Adult Continuing Education (ACE) classes are also available. High school diplomas and post-secondary programs are available through paid correspondence programs. Advanced Occupational Education: FCI Terminal Island offers advanced occupational education in Carpentry, CFC, Electrical Home Wiring, Home Inspection, Plumbing, and Welding. Vocational Training: FCI Terminal Island does not offer any vocational training aside from its advanced occupational education programs and apprenticeships. Apprenticeship: FCI Terminal Island offers apprenticeships in Baking, Cooking, AutoCAD, Cabinet Making, Dental Assistant, Electrical, Electrostatic Powder Paint Machine, Engraver, HVAC, Industrial Truck Mechanic, Machine Setter, Maintenance Repairer, Material Coordinator, Pipefitter, Plumbing, Production Planner-Shipping Clerk, Quality Control, Stationary Engineer, and Tool and Die (Machinist). Library Services: Leisure libraries offer inmates a variety of reading materials, including periodicals, newspapers, fiction, nonfiction, and reference books. The TRULINCS Electronic Law Library allows inmates to access to legal materials and an opportunity to prepare legal documents. Typewriters and a copy machine are also available for inmate use. UNICOR: The FCI Terminal Island UNICOR facility produces office furniture and industrial products. Commissary: Inmates may use funds in their account to purchase items at the institution commissary, place funds on their inmate phone account, purchase TRU-Units for their TRULINCS account, or send funds in another manner. The spending limit is $360.00 per month. Inmates may only shop on their designated shopping day each week. physical fitness, table games, hobbycrafts, music programs, intramural activities, social and cultural organizations, and movies. Art activities include paintings and sketches rendered in any of the usual media (e.g., oils, pastels, crayons, pencils, inks, and charcoal). Hobbycraft activities include ceramics, leatherwork, models, clay, mosaics, crochet, knitting, sculptures, woodworking, and lapidary. Wellness programs include screening, assessments, goal setting, fitness/nutrition prescriptions, and counseling.